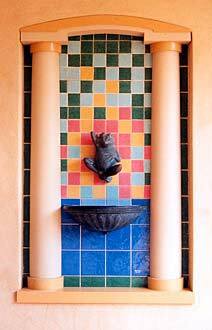 Using the clients' frog and bowl, I created this waterfeature, 'Frog Hollow' for an existing niche. I designed joinery columns, capital and base to mimic the architectural details of the home. Installing this 'frame' allowed me to re-proportion the space in order to focus on the frog and his bowl. The colourful mosaic adds to the sense of fun in this work.